Given that it’s Valentine’s Day and that February is Heart Month, I thought I would share my favourite 'heart' exercises. Your heart is just like every other muscle in your body - it gets stronger and more efficient if you push it. These exercises will definitely give your heart a workout! 1) Mountain Climbers - A great exercises for your core and shoulders, adding 30-60 second intervals of mountain climbers into your workouts will really get your heart pumping! I also recently learned a few new variations of mountain climbers, such as the spider climbers and diagonal climbers, that I am excited to sprinkle into my workouts and fitness classes. 2) Spin Class - This is basically interval training on a stationary bike - what a workout! Classes often include short sprints and hill climbs to get that heart racing! Spinning is also easy on the joints because there is no impact. 3) Stairs - One of the quickest ways to get your heart rate elevated is to run up a flight of stairs. This makes a great add-on to any workout. I once knew this crazy person who decided to run up and down a flight of stairs 50 times, just for fun. I can tell you for sure that this person's heart was pounding. And yes, it was me. 4) TRX Suspension Training - TRX offers a great full body workout and as you transition from exercise to exercise, your heart rate stays up. 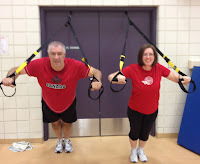 This makes TRX great training for your cardiovascular system as well. 5) Walking Outdoors - Sometimes it’s just nice to get out and breathe in some fresh air! Your heart rate elevates any time you start moving so even walking is good for your heart. Walking outdoors is even better when you stop every couple of minutes to hit a little white ball towards a hole with a flag in it! Now get that heart going and enjoy a Happy Valentine's Day!